Hi! We’re a couple, no kids, and we shop at Costco. Most people may think that Costco is only for large families, but it actually works for two people too. We’ve been members of Costco for about 10 years now. We started out going to Costco only every so often. Over the years, we’ve slowly increased our trips to Costco. It’s been several years but we now shop at Costco once a week. Regular items in our cart include bananas, apples, grapes, blueberries, pineapple, watermelon, lettuce, spinach, bell peppers, chicken, pork, beef, lamb, salmon, soy milk, yogurt, eggs, coffee, bread, cereal, oats, clif bars, flax seed, etc. Then there’re the toiletries, household items like foil, zip lock bags, cleaning supplies, etc. We’ve bought tires and car battery at the auto department and gotten prescription filled at the pharmacy. Computers, laptops, cameras, jewelry, clothes, mattress, toaster oven, rice cooker, luggage set, books, wine, vitamin supplements and even a gym membership are some of the other things we’ve picked up along the way. One thing that we do not purchase at Costco are desserts. The Costco muffins,pies, cakes and other goodies are really yummy but they’re too “dangerous” to have in the house with only 2 people. We’d end up eating the whole thing and adding tons of calories into our diet. But they’re great for parties or events with lots of other people. We do wish Costco would make smaller portions of their sweet treats. One of the common complaints we hear about Costco is that you tend to spend more more at Costco because you see and pick up stuff you don’t need, therefore spending more money. But we think that is true when shopping anywhere. The solution is to make a shopping list and sticking to it. 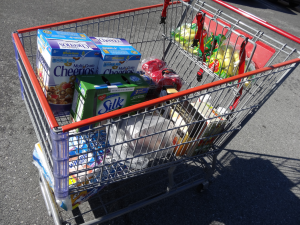 We feel that we’ve actually saved money since making Costco our main place to get groceries. Previously, we would look at the grocery store sale flyers each week and try to purchase whatever is on sale that week. But that requires going to one or 2 grocery stores a week. Each trip requires additional time and effort and another chance to veer off the shopping list. It’s much easier for us now that we’ve simplify our grocery shopping to one main place. The farmers’ market and other grocery stores supplement whatever we can’t get at Costco. Another bonus is that over the years, Costco has added the number of organic items carried at the store. You can now find organic apples, blueberries, grapes, lettuce, spinach, carrots, raisins, milk, flax seed, ketchup, honey, agave sweetener, quinoa, snacks and many other organic items at Costco. The best part is that the prices for the organic items are not much higher like in other stores. We do not feel like we’ve to sacrifice our budget in order to eat more organic food. What we’ve realized is that eating out costs a lot, even for average or worse, below average food. You can purchase USDA Prime Filet Mignon at Costco, cook it at home, and it’d taste way better and still cost less than your average restaurant tab. 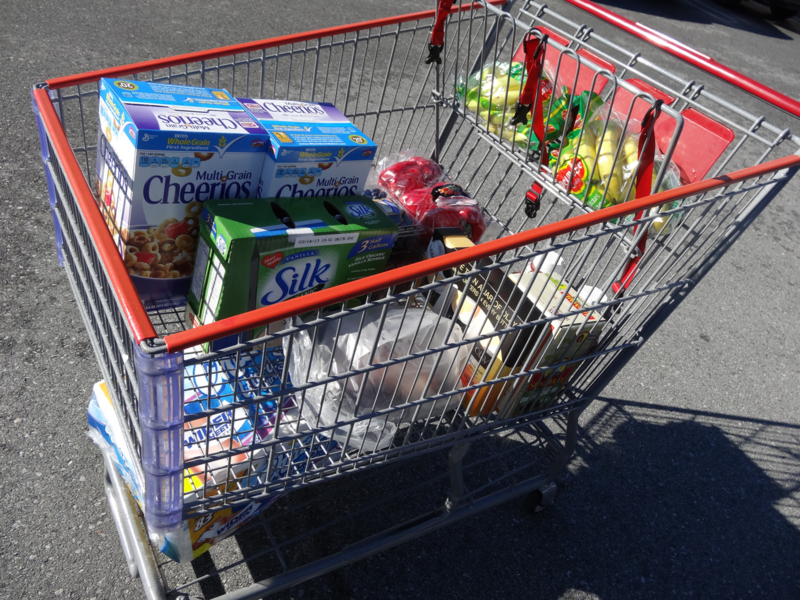 Even if you’re single or live alone, shopping at Costco could still make sense. You can still save by purchasing selective items, maybe just not the 30 rolls of toilet tissue or 10 lbs of meat. Prices at Costco are generally lower for personal care products like shampoo, moisturizer, body wash, oral care; prescription drugs, supplements, etc. If you have a dog or cat, Costco has great prices on pet food and supplies as well as prescription drugs for pets. We thought it’d be fun to share some of our experiences, products and deals we see along the way and meet other Costco members/fans via this blog. Since Costco carries different items at different locations, it’d be really interesting to hear what other Costco members find at their stores that are not at ours! Please note that we are NOT affiliated with Costco in any way. We do not work for Costco. We are not paid by Costco. We do not receive free goods or services from Costco. Any mentioned purchases were paid for out of our own pockets. We are not paid to express favorable opinions or otherwise about any product, service or about Costco itself. We take photos of and write about whatever products, services, deals we see at Costco that we deem interesting. We are regular Costco members and shoppers. All items mentioned are while supplies last only. Inventory and pricing at your local store may/will vary.